Why are USB memory sticks also called flash drives? Because the storage technology behind it is called flash memory. If you’re wondering what that means I can’t promise that you will be smarter at the end of this article. But what I can do is give you some textual and visual ideas. Latter is what I always find to be most helpful. So at first a brief text definition. Flash memory is a type of EEPROM which stands for Electrically Erasable Programmable Read-Only Memory. It’s a non-volatile memory that can store little data chunks especially when there’s no power. When the chunks need to be larger the specific flash kind is used. In other words, usual EEPROM is only byte-erasable whereas Flash is block-erasable. I’m sure you already feel smarter or lost. Ok, then let’s have a picture that shows the typical interior of a USB flash drive. Uhm, ok. Now, 0 means a transistor is off and 1 means it’s on because the gate is open and electricity can flow. With a regular transistor the data would be lost once the power is turned off because that shuts down the whole thing and it stays in the 0 position even when power is back on. 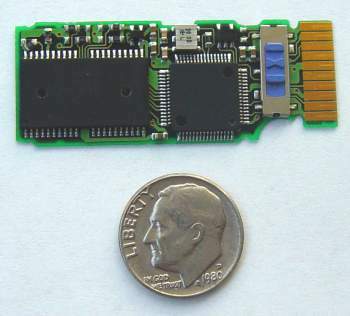 A flash memory cell however saves the data because it’s basically in a permanent 1 position. That’s due to its second gate, the floating gate, which enables electricity to stay trapped between it and the first gate. The data can still be erased though by draining the electricity out, that’s what the drain to the right is for. I guess I could try to get into more detail now but to be honest, I really don’t understand most of this stuff. I just use these sticks and think they’re cool. What I’m left wondering is: Why is it actually called Flash? Is it just some fancy marketing phrase? Either way, if you want to get deeper and feel this urge to also know what a microcontroller is for I advise you to join a geek forum or sift through the tons of articles out there on the net. Then please come back and post an explanation. Electrically Erasable is a big deal. In the old days, memory had to be erased using a UV lamp. The parts had a window above the die. Those days are now thankfully past us. Flash comes from the idea that entire part can be erased with one “flash” of the UV light. are you sure you mean UV light? Mike explained it correctly. It’s the ideas of erasing it “in a flash” regarding time. Hi DT, thanks for explaining USB related concepts in detail, I think I learned a lot. if you describe flashing in one line….??? what do you mean “flashing”? To describe how a flash memory works I’d need more than one short line. Maybe somebody else can? Flash memory is probably the greatest invention of mankind for the last time. I do not even know how to look right now is an invention without such devices. 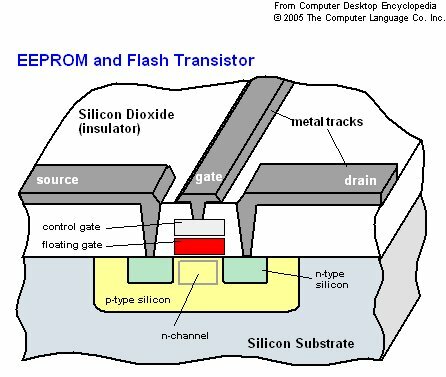 Thanks to the author for a detailed explanation of the structure of flash memory. Now I felt that really became more aware of this. i dont know what a flash is and what it does – all i know is that students carry it around for nothing….LOL…. i think they shove it up peoples…. It was nice learning about these small details. Thanks for making me a little bit smarter today! I’m in 8th grade… how the heck am i supposed to understand this stuff. i’m just trying to figure out why magnets don’t affect flash drives for a science experiment. These fancy contraptions weren’t around in my day. When we had to read or write data, we did it ourselves with two tools: Pencil and Paper!! flash storage works via electrons and is non-magnetic. And normal magnets cannot harm it like erasing all the data (as in the good ole days of floppy disks . For more information you may want to check out my comparison between flash and hard drives. Very interesting post. I will surely come back and read more of your posts. It is quite easy to read and understand at the same time very educational. Thank you. So if I have a flash drive that is locked up on me and won’t let me erase the data because it turned read only – can I put a different voltage on it to flash it? How can I get it to drain the electicity? I honestly have no idea, Dee. I think the only feasible thing to do would be to try to unlock it again from “read only”. Usually you can switch between the two modes – write and ready only. Other than that, maybe a factory reset? I never think the flash drives can look cool like this, ideal for working and school.Cool technology stuffs for everyone to make working and learning more fun.